Forgotten skills. Ink on paper. Pens and ruled pad. The uncertain scratching of the pen’s tip on white paper produces sensuous friction. It soothes the nerves. It brings liberation like a day-old itch that has just been scratched. I haven’t written in the old-fashioned way for quite some time. And I miss it. I saw it done here once and I thought I would give it a try to see if I could still write with a pen. I yearn for forgotten habits and lost skills. penmanship (comment dit-on en français?). je souviens que nous l'avons appris en école de grade 1 à grade 6. Indeed a nice handwriting. You should not use a keyboard & computer but write everything down with a pen & paper. SIDNEY--thanks. for a long time, i had this crazy obsession for 17th century calligraphy. i should find time to write longhand again. it's therapeutic. i happen to read books on graphology. hmm, interesting strokes of t and i.
does it actually work, graphology? my penmanship has been analyzed twice by two different people. in both instances, i purposedly changed my strokes slightly. they both gave me outlandish analyses that did not even come close to who i actually am. hehe. but i'd love to have it analyzed again. maybe you can practice on my penmanship? send me your analysis privately, hehe. slim, i now offically declare you as the only male person i know with an alluring penmanship. much more maarte than mine. god is cruel. RMACAPOBRE--very interesting. i'd like to have it analyzed again. SUNSET EYES--don't blame god. blame your gradeschool's copy book. i just took my penmanship lessons in grade 1 too seriously. the other curves and embellishments, i got from calligraphy books, especially from 17th century letters. if you change your strokes, the analyses would of course, change too. 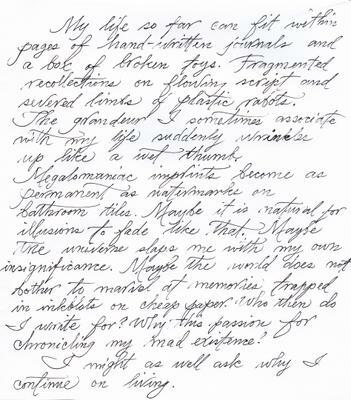 i think a person's penmanship reflects his personality to some extent. but i don't do analysis. i just read the book and secretly validate penmanships of those people I know for fun. probably it does reflect a person's personality. i just wonder how'd they analyze the handwriting of students from assumption college, where everyone is required to follow a very strict penmanship copy book. they practically have the same penmanship there. jesus, that's your handwriting? it's a trillion-billion-gazillion times prettier than mine. and i'm a girl.